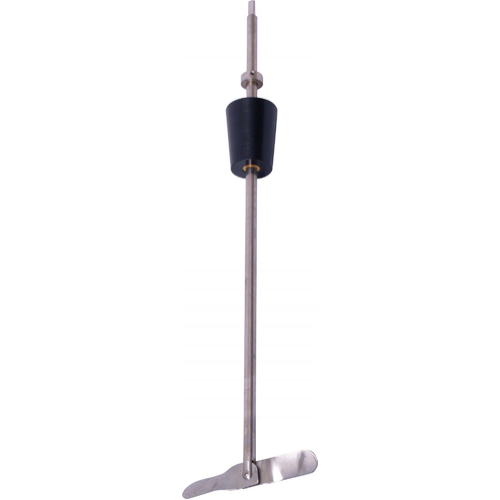 Used to stir up lees in a barrel or to ensure a complete mix of so2 or any other addtives, our stainless steel lees stirrer with 24" solid stainless shaft and fold out stainless paddle will get the job done quickly and efficiently. Connect to drill and use on lowest speed. Included black plastic bung seals barrel while stainless shaft spins freely. Once attached to a drill and angled correctly, can this be used on stacked barrels? BEST ANSWER: Not with the racks (7" 2 barrel) and cordless drill we use - I just tried it. We use both 60 and 30g barrels and there's not enough clearance to get the drill onto the stirrer inserted into the barrel.